The art of American expatriate James Abbott McNeill Whistler displays affinities with French Realism and Impressionism. The public best remembers the artist as a painter, known especially for the painting of his mother, Arrangement in Black and Gray No. 1. 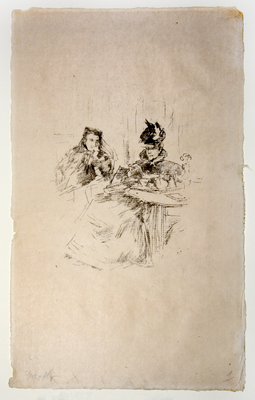 Whistler was also active as a printmaker and the lithograph Afternoon Tea is a double portrait of his mother-in-law, Frances Birnie Philip, and her daughter, Ethel Whibley.